One of the most popular monuments of Spain, the Arcos de Santa Maria was built in fourteenth Century and remodeled by Juan de Vallejo and Francisco de Colonia; the Arcos is of a autonomous community of Castile and Leon. 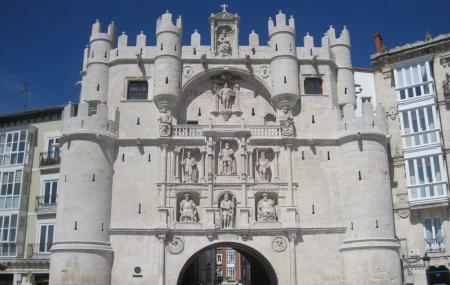 It is one of the 12 gates of the city in the medieval times. At the entrance, guarding the city are the Castile heroes and kings, the bottom row consist of the first judges of the town,NuñoRasura and Lain Calvo who are flanking the town’s founder Diego Porcelos as if in protection, while the top row from left to right consist of the fierce warrior Cid, Emperor Charles V and FernánGonzález.The Promenade mall connects Santa Maria to the cathedral. The door: The door was manufactured with the triumphal arc in mind and the two together make a winning combination. The 6 niches: These niches contain figures that are significant to the city such as the founder, the count etc. The facade: The façade has been beautifully constructed and is in itself enough to attract a large number of tourists. Mudejar Plasterwork: The Mudejar Plasterwork was what the wall was initially made of and some of this has been retained in spite of renovation. Visit the promenade mall and the other attractions nearby. Do have coffee from a local café. How popular is Arcos De Santa Maria? People normally club together Museum Of Human Evolution Or Museo De La Evolucion Humana and Museo Del Libro Fadrique De Basilea while planning their visit to Arcos De Santa Maria. A very detailed structure, so interesting. Be ready to enter medieval Burgos through this amazing gate, very well preserved. You can even get in for free and admire the fantastic wooden ceilings, the views from the tower, or some temporary exposition inside the rooms.